TechRadar is a big fan of Asus’ Eee PC, so we welcome today’s news that the second generation is set to feature the new 8.9-inch touchscreen display and, possibly, full GPS support. The new version Eee with an 8.9-inch screen, in 8GB or 12GB models with the latest 1.3 model camera, is set to release before the end of April and the touchscreen version should follow at a later date this year. Asus should confirm pricing and UK release dates with us shortly. In addition to the main new feature of a fully resistive touchscreen screen, the next version of the Eee will also feature a tablet PC style rotating screen and, still to be confirmed with Asus, there is also talk of GPS support. Asus in the US has said that the price point for the touchscreen Eee will, as is expected, be highly competitive, in the region of $500 (£250). "These kind of features don't come cheap, which means that the 9-inch Eee is slowly turning into an 'Eee Deluxe', probably complete with deluxe price tag. "The Linux distro that ships on the Eee doesn't have much that can really take advantage of a touchscreen, so, while extra features are always welcome, I'd hate to think I'm paying more for things that only really come into their own when you install a custom OS." 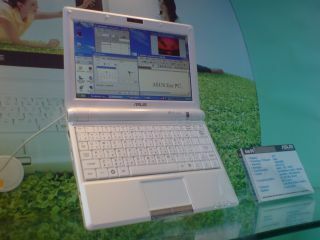 Stay tuned for more on the latest Eee PC news from Asus as we get it.